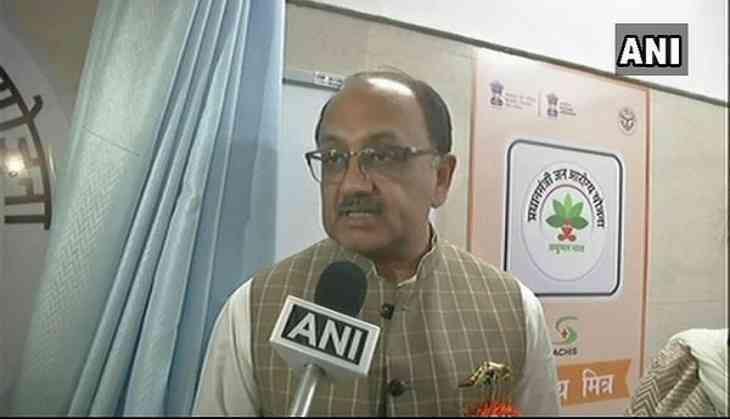 Around 1.18 crore families from Uttar Pradesh will be benefited by Rs 5 lakh health cover under Pradhan Mantri Jan Arogya Yojana (PMJAY), announced state Health Minister Sidharth Nath Singh on Tuesday. "PMJAY was announced by Prime Minister Narendra Modi on Independence Day from ramparts of the Red Fort. The beneficiaries are mainly from the Schedule Caste, Schedule Tribes which have been identified as per socio-economic caste census. Around 1.18 crore families in Uttar Pradesh amounting to approximately six crore people will be given Rs 5 lakh health insurance under Ayushman Bharat-Pradhan Mantri Jan Arogya Yojana (AB-PMJAY)", he said while addressing the media. The minister said that the state government would further extend the benefits of this scheme to eligible beneficiaries left out of 2011 census. "As per central government scheme, only those people who are listed in the census 2011 will be benefited by it. However, this is a 2011 census hence it is plausible that some people would have left out of it. Uttar Pradesh Government has decided that such beneficiaries will also be included under this scheme and a survey is going on for the same," he added. Elaborating further on the model of the health insurance scheme, he said, "Daycare facility such as laser operation or dental procedures will also be covered in this scheme along with the treatments requiring hospitalization. Even after post-hospitalization, the consultation and medicine fees will be covered under this scheme. A total number of 1350 serious diseases are covered under this scheme." Singh also talked about Uttar Pradesh government's preparedness for the successful launch of this scheme and said, "For better implementation of this scheme, we are making provisions of 'Arogya Mitra' in every hospital who would help beneficiaries of this scheme with the process. Till now we have listed 274 hospitals and have received an application from 700 more hospitals. On 25th September when this scheme will be launched by Prime Minister Modi across India as well as in Uttar Pradesh, we expect that about thousand medical centres form Uttar Pradesh will join the initiative." He also announced that for better implementation of the scheme, the state has been divided into four zones. Singh also displayed the model of a 'Golden Card' which will be issued to all beneficiaries of PMJAY in Uttar Pradesh. Announcing the scheme on August 15, Prime Minister Modi had said, "Pradhan Mantri Jan Arogya Abhiyaan will be launched on September 25 this year. It is high time we ensure that the poor of India get proper access to good quality and affordable healthcare".